I just love warm summer nights that call for sipping a cocktail or two in an outdoor patio. And of course a special night out calls for some fun accessories. I went out of my comfort zone with this black clutch from Rebecca Minkoff for mark. It's a little rocker, a little biker, a little Texas in my estimation. What do you think? Anyway, it's always fun to experiment and step outside of one's fashion comfort zone so I went with it and added a few gold accessories to give it a little contrast. I know it's barely Thursday but I'm ready for the weekend. You are so pretty and so stylish. I wish I had a fraction of the style that you have. I love your purse and your jewelry. The south Texas nights have been nice recently. Wow, awesome handbag! It does have a slight Texas vibe, in a very cool way. I like that you mixed silver and gold. Love this!! 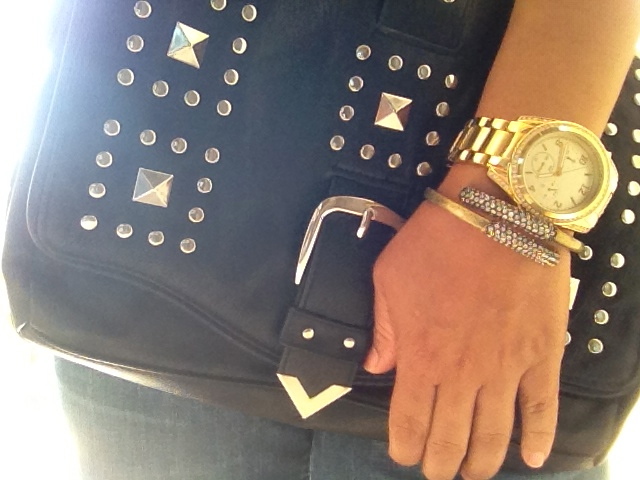 your arm party looks amazing! !